Busy depot with trains going in and out on the same track! Here’s how it is done: Send train to depot of type like the above, while it is half way in click the ignore traffic light button. 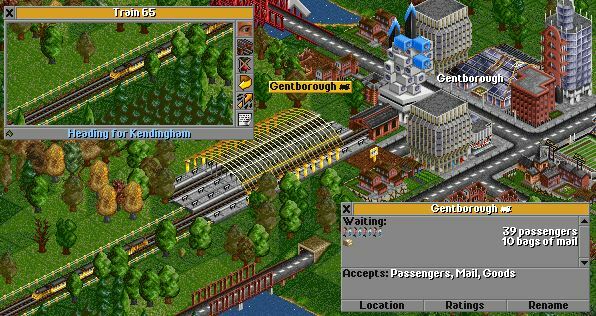 This entry was posted in Transport Tycoon and tagged game cheat on October 18, 2015 by gmgolem. Transport Tycoon – Megalev on railroad tracks?! 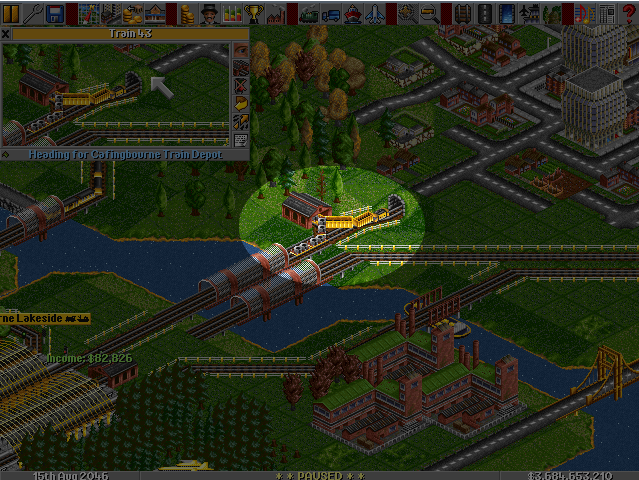 During the later stage of a game, it is a common headache to upgrade railroad when newer system is available in Transport Tycoon. Not to mention complex network crisscrossing every other route, demolishing and rebuilding even a straight track could be tiring. This trick was discovered by accident and works like this: if a road track and a railroad track is on the same tile (which has always been legal for road vehicle to cross through railway), Megalev vehicles can pass straight through instead of stopping for wrong type of track! This essentially allowed Megalev to run on railroad track all the way without forcing player upgrading to Megalev track. There is a catch though. Since the only legal way to lay road perpendicular to railway track is on flat surface and “straight” railway track, there is no way for this trick to work on slopes, nor any complex railroad tracks. No workaround except to build connect with a real Megalev track on slopes. Now, it is time for some accounting to compare the total cost. The convenience for not demolish and rebuild by using the road junction trick cost almost double. This entry was posted in Transport Tycoon and tagged game cheat on April 25, 2015 by gmgolem.